The Kosher Baker - The Bible of Dessert Cookbooks! - Kosher In The Kitch! The Kosher Baker - The Bible of Dessert Cookbooks! - Kosher In The Kitch! Home / Desserts / Cake / The Kosher Baker – The Bible of Dessert Cookbooks! The Kosher Baker – The Bible of Dessert Cookbooks! rich frosting. There is nothing more satisfying than ending a meal with a slice of moist rich chocolate cake. I am the girl who makes chocolate chip cookies just to eat the raw dough. Brownie batter? That’s my drug of choice when I need an instant mood lift. When going out to eat, I would often choose a restaurant based on their dessert selection – naturally, my husband and I often found ourselves at dairy places! You can imagine my dismay when my doctor recently told me to avoid all things dairy while nursing my son. I can easily give up my pizza and Greek salad, but what about dessert? Good news! 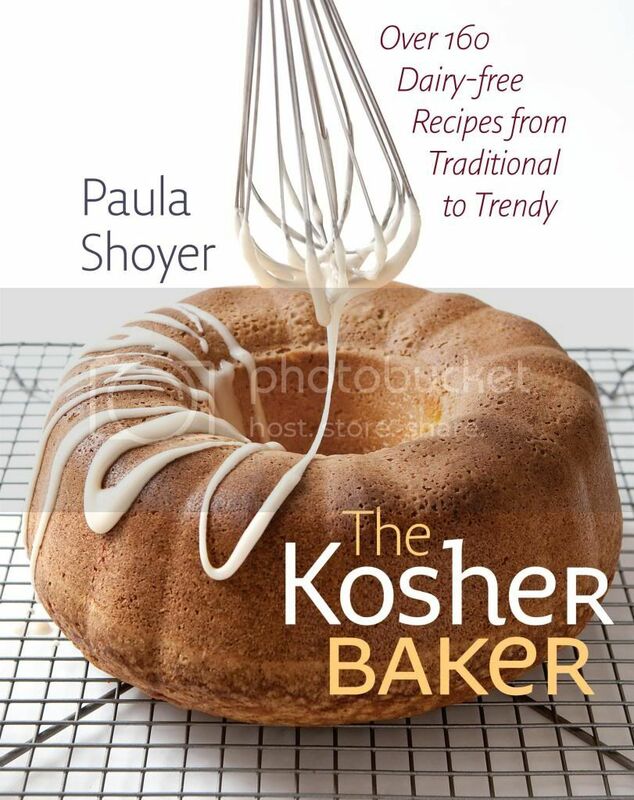 Just in time for my non-dairy diet, I found “The Kosher Baker”, by Paula Shoyer, which contains over 160 dairy-free recipes! When I saw the photo on the cover of an Orange Tea Cake being drizzled with white icing, I knew I had found the bible of dessert cook books. I spent an entire Shabbat looking through all of the recipes, eagerly turning each page in search of my next favorite treat. Not only is every imaginable dessert listed, but Paula has organized them into sections, such as “Quick and Elegant Desserts,” “Two Step Desserts,” and “Multiple Step Desserts and Breads.” This makes it a breeze to sort both by preparation time and how much you want to impress your guests. Storage: Store covered in plastic in the refrigerator for up to four days. A galette is a free-form, rustic-looking French tart. You roll out the dough into a large circle, place the fruit in the middle and then fold up the sides of the dough to partially cover the fruit. You can combine any types of fruits you like that add up to 3 cups total to create your own signature dessert. This is a good way to use up some soft fruit you have around. I made three different flavor tarts when I spent Shabbat at my friend Elena Neuman Lefkowitz’s beautiful, brand-new house in Westhampton Beach, New York. She had not yet fully outfitted her kitchen with equipment so I rolled out the dough using a wine bottle. It worked surprisingly well. 1. To make the dough: Place the flour, salt, and margarine into the bowl of a food processor fitted with a metal blade. Pulse 10 times or cut the margarine into the flour and salt by hand using two knives or a pastry cutter. 2. Add the egg yolk (reserve the white) and 1 tablespoon of the ice water. Pulse 5 times or mix gently by hand. Add another tablespoon of the ice water and pulse another 5 times or mix again. Add the last tablespoon of water, a little at a time, pulsing or lightly mixing the dough for 10 to 15 seconds until it looks like clumps of couscous; the dough does not have to come completely together. Gather the dough into a ball. 3. Take a large piece of plastic wrap and sprinkle some flour on top. Place the dough on the floured plastic, wrap the plastic around it, and then flatten. Place the dough in the freezer for 20 minutes. 4. Preheat the oven to 425ºF and place a rack on the lowest shelf of your oven. 5. Take a large piece of parchment and sprinkle it with some flour. Remove the dough from the plastic wrap and place it on top of the parchment. Sprinkle some flour on the dough and then place a second piece of parchment on top. Roll out the dough until it is about 12 to 13 inches wide, trying your best to keep the shape round. Peel back the top parchment and sprinkle some more flour once or twice while you are rolling. 6. To make the filling: Place the fruit in a medium bowl. In a separate bowl, mix together the sugar and cornstarch. Sprinkle on top of the fruit and mix gently. 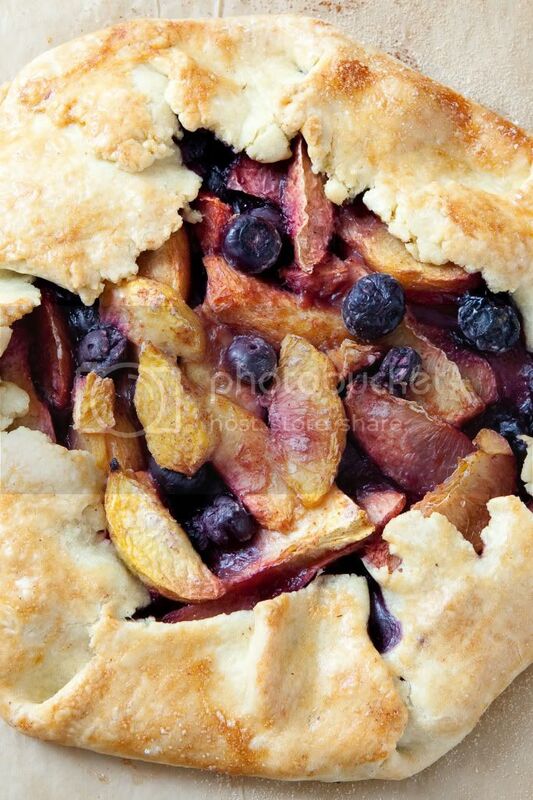 Place the fruit in the center of the dough circle and spread it outward, leaving a 2 to 3-inch border on the outside. Take one small section of the dough border, about 2 inches, and fold it over the fruit, leaving the fruit-filled center open. Pick up another 2-inch section of the border and repeat, pressing one section into the next to seal it, so you end up with dough pleats. 7. Beat the reserved egg white and brush all over the dough. Sprinkle with the teaspoon of sugar. Bake for 30 minutes. Move the galette to a middle rack in the oven and bake another 10 minutes. Let cool for 20 minutes. Put bluntly: Does this book use REAL flavours and ingenuity, or just margarine and fake whipped topping, etc., in creating its great pareve desserts…?